It's been a lonnnng time since I purchased any type of jeans that were not a traditional skinny style. Boot cut always look too dated on me and there are absolutely no flares that work with my incredibly short inseam. Hence, I always went for the skinny style. Until I saw this pair of Frame denim available during the Anniversary sale and adored the slightly straighter leg, but more than anything - loved the staggered hem! They are definitely a style you either love or hate and once I tried them on, I thought they were so unique. Maybe it was the fact that the front of the hem fell perfectly at my ankle without needing any hemming which sold me initially. LOL Either way, I am loving the look for fall and can wear these with flats, heels, boots - the options are endless! 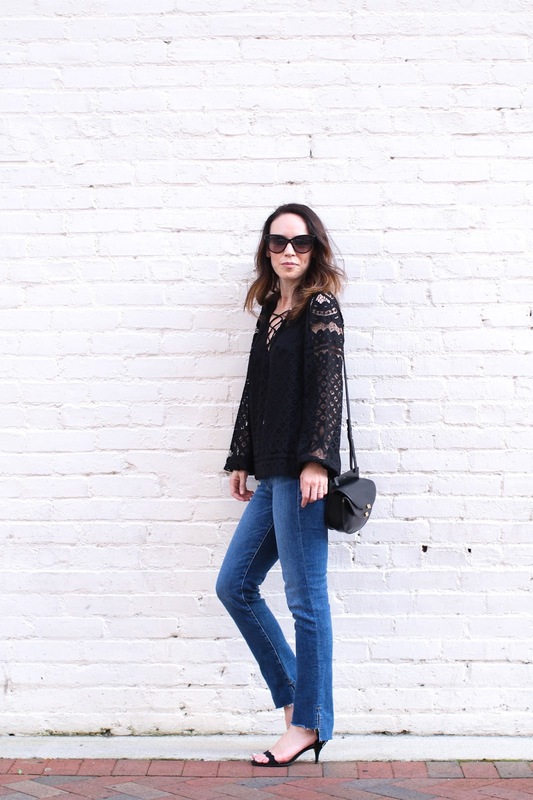 I paired the jeans with this boho lacy top that felt very 'end of summer' to me, though the long sleeves make it perfect to wear into fall. Speaking of jeans that I love, this pair that I have been wearing all summer has finally been restocked and I highly recommend getting them. I cut off the hem myself and loved the look, but you can just cuff them as well for a cute cropped look.